Exclusive collection of mosaic backsplashes, plaques and accents tiles of falling leaves. 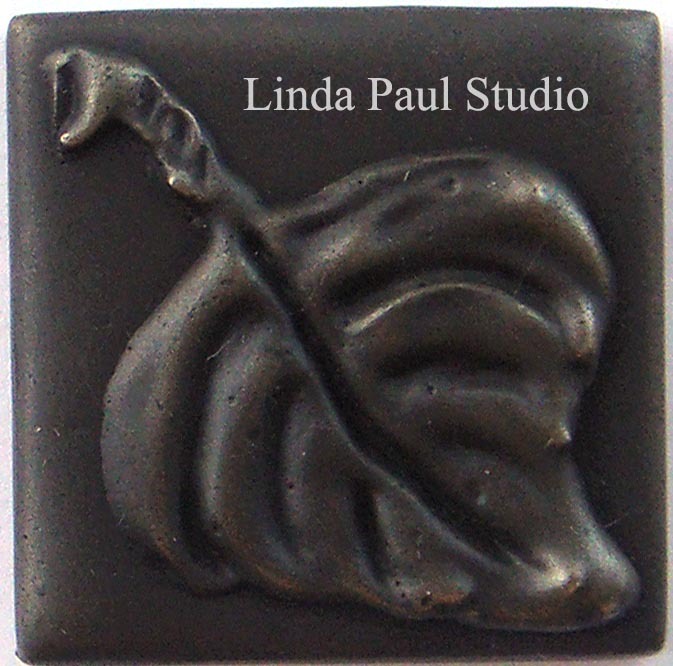 The stone and metal medallion comes mounted on a mesh backing. 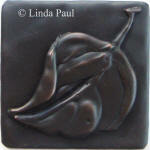 Its perfect for a kitchen backsplash or anywhere you need beautiful unique art on tile with metal accents. 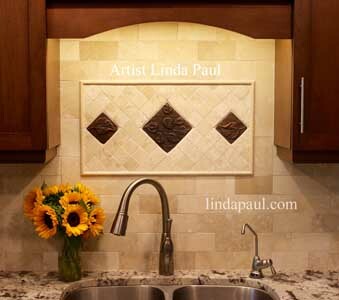 These medallion backsplashes are lovingly hand-crafted in the USA. 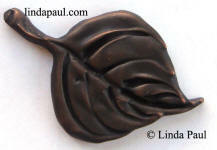 The medallion comes mounted on a mesh backing. 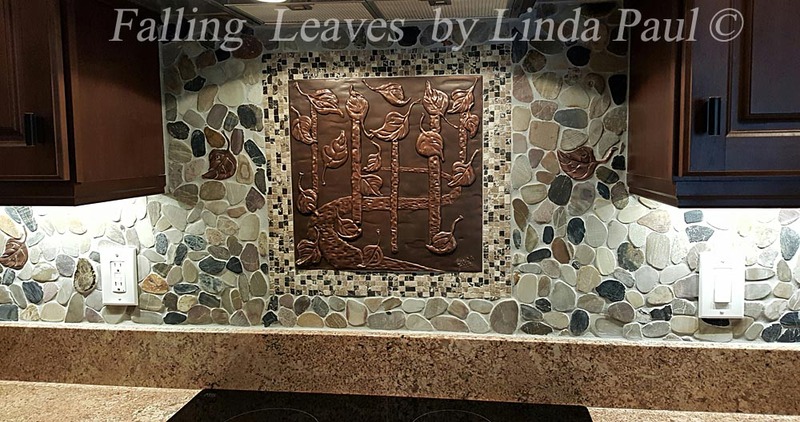 You can order this beautiful backsplash in any of the stone colors or metal finishes below and you can order the plaque separately. 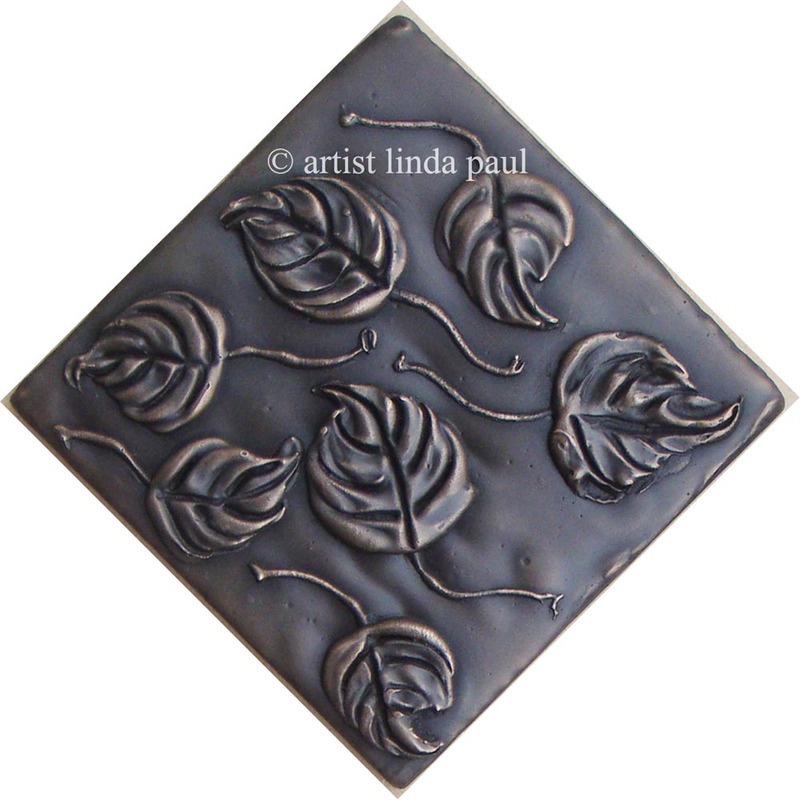 Falling Leaves Mosaic Tile Backsplash Medallion 24" x 24"
You can order these plaques in any of the finishes below or a custom combination finish. 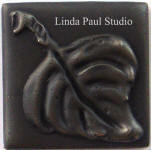 Just contact us to order or if you need help with the finish selection. Metal finish pieces installed above a cook top, must be set 5 to 6 inches above and 3 to 4 inches back from heat source and have a minimum 2 inch set back from the profile (face of the tile). 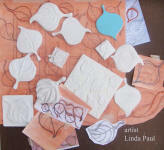 Not doing this will void the warranty. 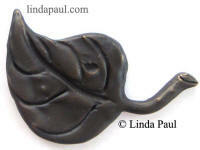 Falling Leaves plaque with Bronze high polish on leaves, trees and stream and oil rubbed bronze on the background. 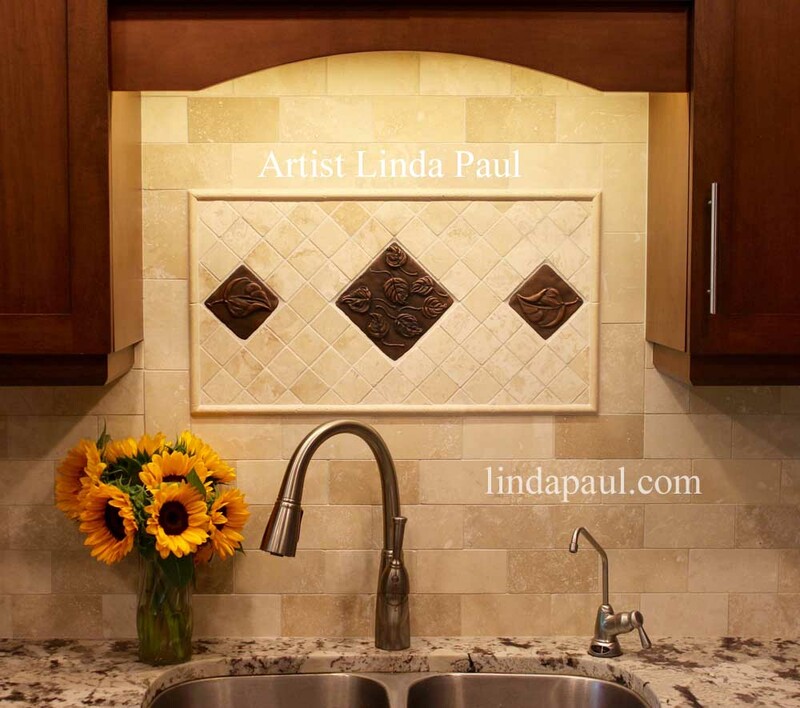 This onlay glues right over top of your existing tile backsplash tile or onto any surface including wood, stone glass etc. You can turn this tile any direction to create a pattern of falling leaves. 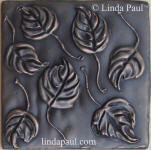 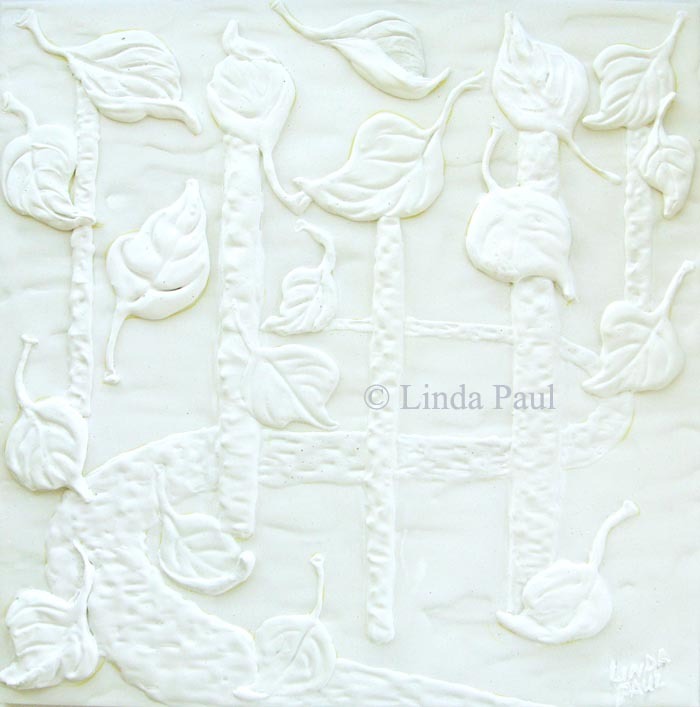 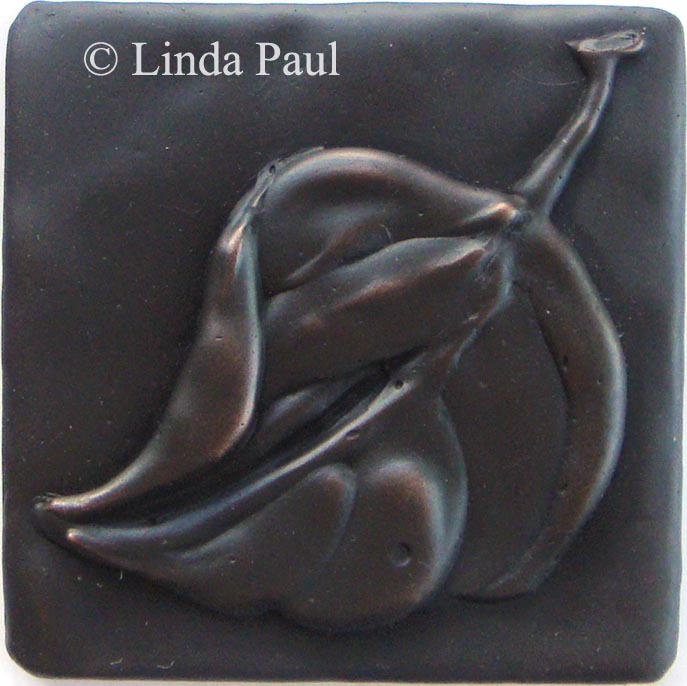 Accent your subway tile backsplash with this 3x6 falling leaves metal tile by artist Linda Paul . 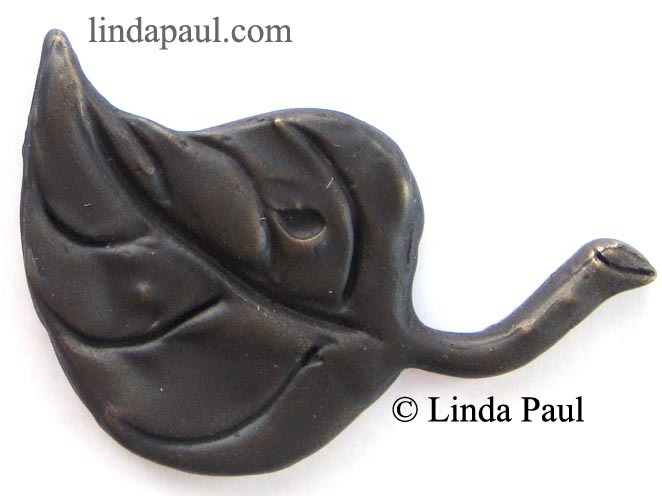 It comes in all the finishes at the bottom of this page. 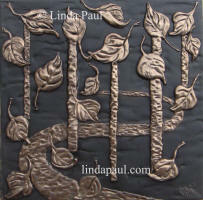 Artist's Inspiration and Process: My inspiration for this new collection is aspen leaves and trees. 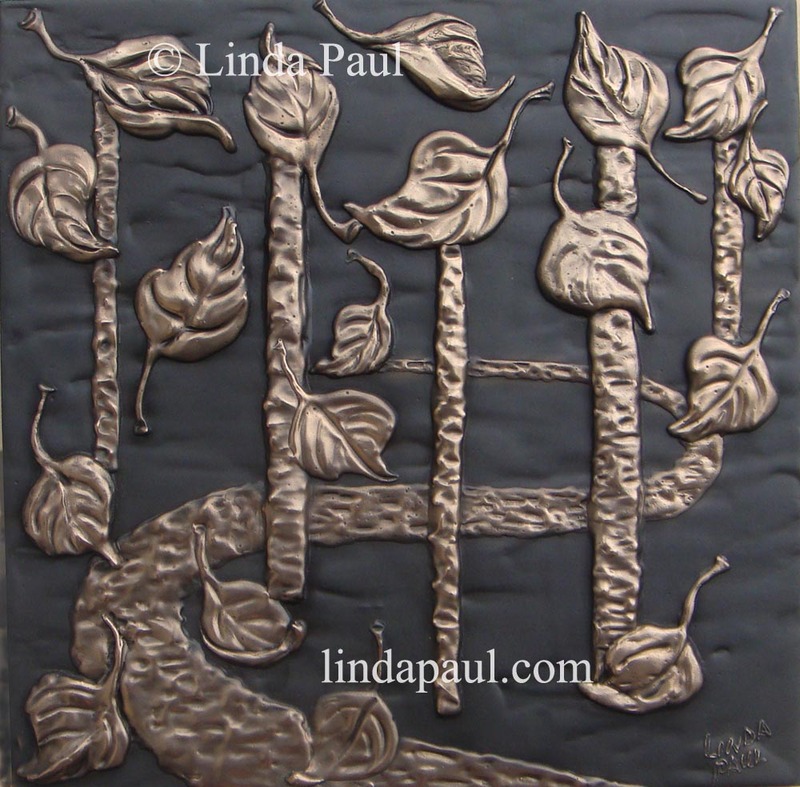 Here in Colorado the aspen are magnificent any time of year in the way they catch the breeze, the leaves seem to dance with a delicate litheness. 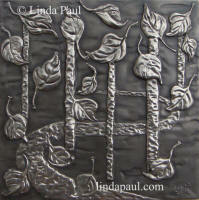 To create the metal pieces I first had to create bas-relief sculptures from which casts were made. 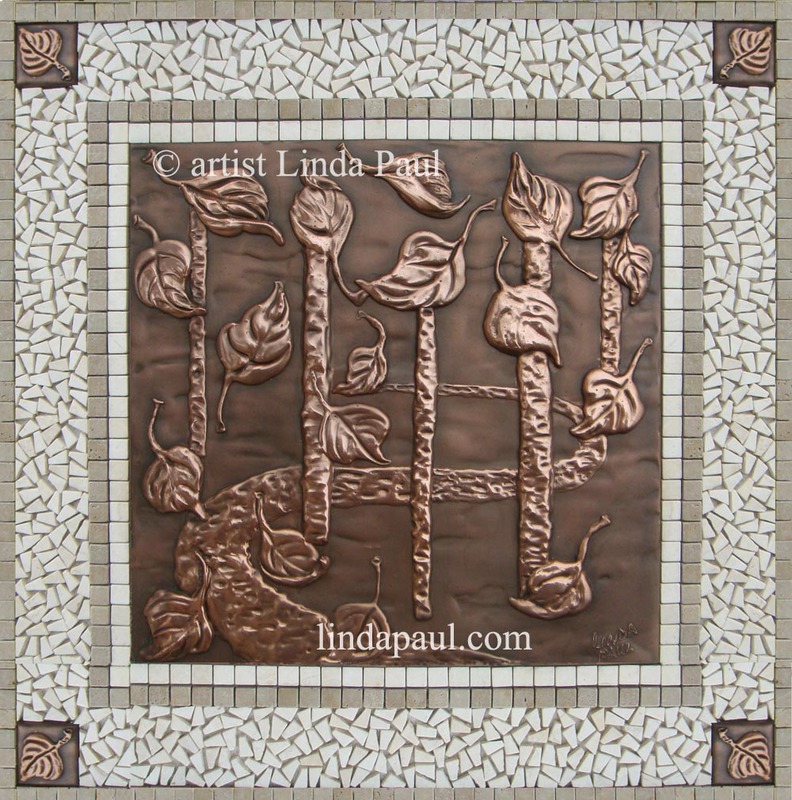 See below for pictures of the original sculptures by Linda Paul. 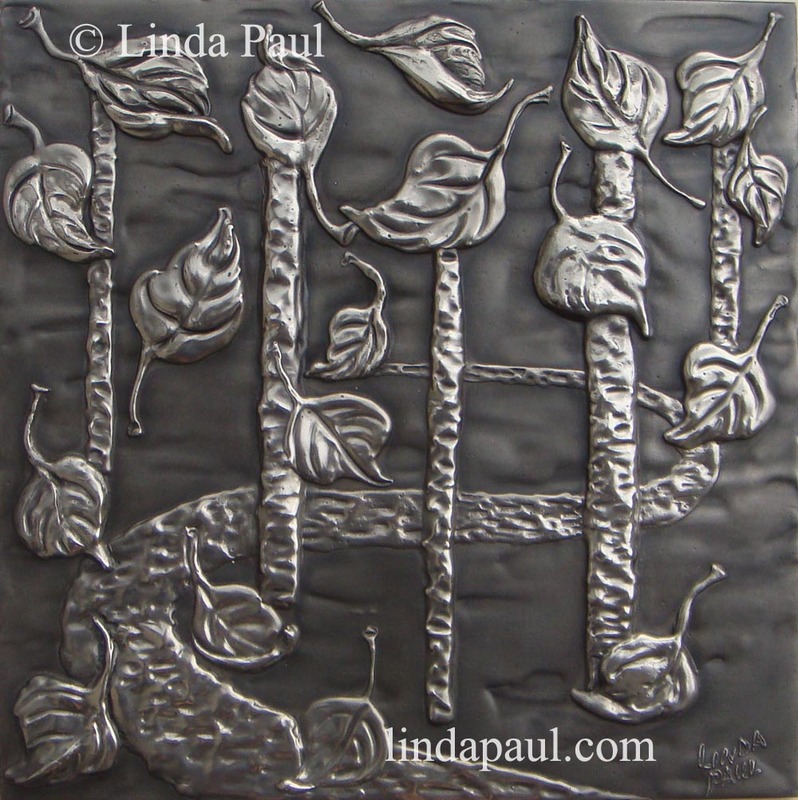 Once the pieces are cast in resin they are metal coated in all the different finishes The aspen leaf plaque centerpieces, leaf accent tiles and onlays come in 19 different metal finishes (see bottom of page) including oil rubbed copper, bronze, nickel, stainless steel and brass . 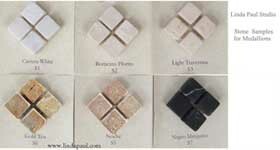 You can choose from 7 marble and travertine stone colors for the medallion. 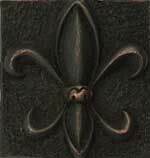 You can by the center plaque separately. 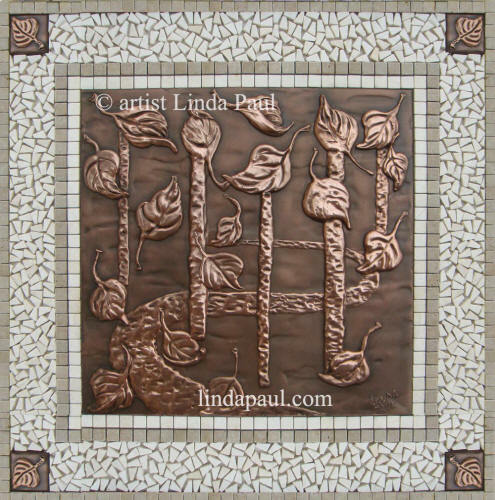 It features the sculpted signature of artist Linda Paul is the lower right corner. 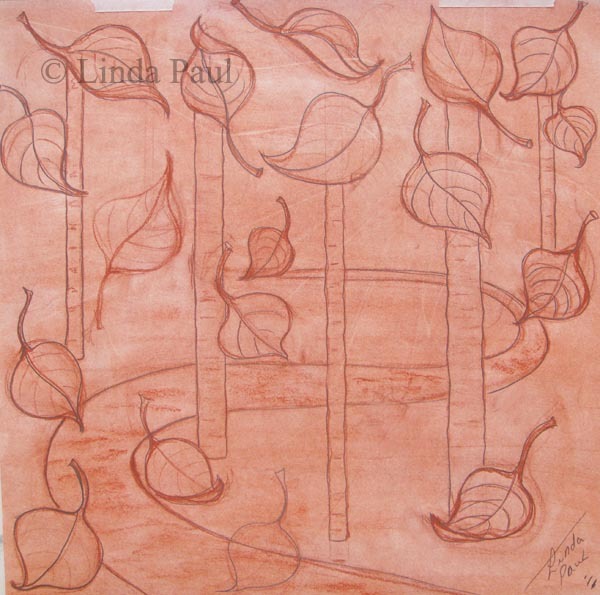 All pieces are mounted on to a mesh backing. 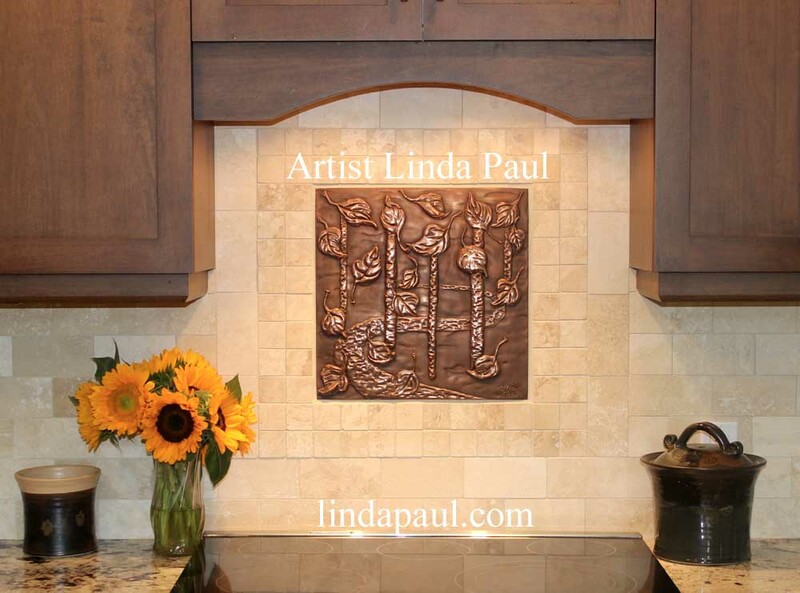 Just glue to the wall and grout the mosaics. 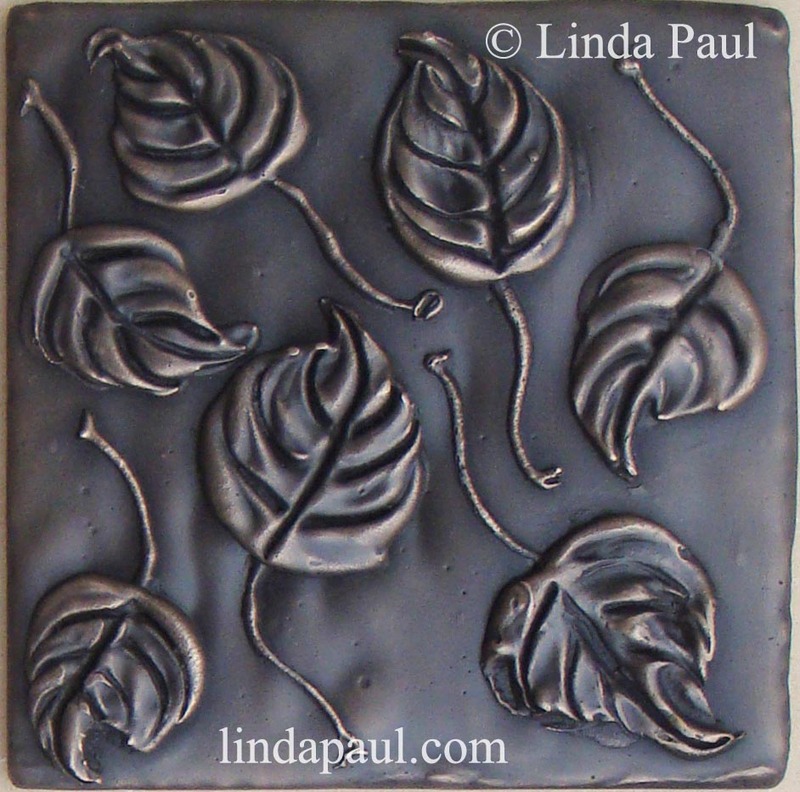 The same customer installed some matching leaf tile accents by Linda Paul over her sink area. 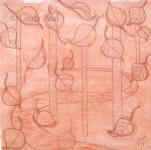 in sizes 12x24, 18 x 36 and 24 "x 48"